AOC has launched two new monitors with 10-point touch displays for Windows 8. 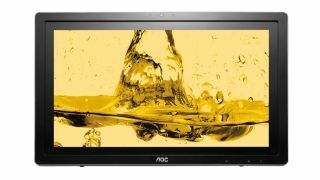 The first model is the i2272Pwhut, which features a 21.5-inch full high-definition WLED-backlit display. The second model is the i2472Pwhut, with the slightly larger 23.6-inch display. Both can be adjusted from 15-degrees to 57-degrees for an almost horizontal viewing experience. The displays employ IPS panels that allow wide viewing angles of 178-degrees. They offer a luminosity of 250 cd/m2 and 5ms pixel response time. The monitors come with several USB 2.0 and 3.0 ports, two HDMI ports, built-in 2W speakers, a 720p webcam, and a microphone. Both models are fully certified for Windows 8. The displays come with ten-point infrared touch control, which allows users to take advantage of the tablet-style interface, type business emails from the screen, play games, or even play a virtual piano. A MHL function also lets users connect their Android device to display mobile content on the big screen. The i2272Pwhut retails for £259, while the i2472Pwhut costs £289. Both launch this month.